There are no right answers to any of these questions, they really depend on your preferences and unique wedding specifics. 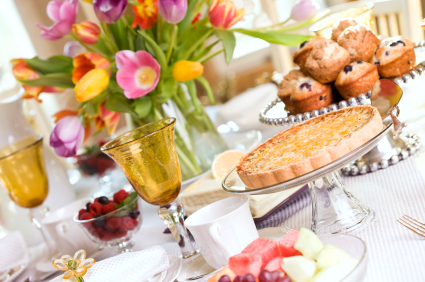 Typically the brunch is at one of the parents or immediate family member’s house and either they can choose to cook (which most likely they will be too tired) or their close friends can offer to do a pitch in. If you want to open gifts together make sure you organize this the night before to have all of the gifts brought over to the house where the brunch will be held. It is also fun to have a TV ready to look at photos or videos from the wedding – usually you will get some good laughs and stories being told. There is always the option of catering the meal or having everyone meet out at a restaurant. This will save your family from having to clean their house before the wedding or prepare food. The downside to having it out at a restaurant is it will be more expensive in addition to you won’t have the comfy couches to lounge around on while you chat! What food should we have prepared? This is up to you, but I always suggest to keep it simple. The morning after brunch is for you to gather together and spend some relaxing time as a family before everyone drives home, not have a 4 course meal of gourmet breakfast food. You all just came off a big meal at the wedding last night so light finger foods should be just fine. Do I need to have activities at brunch? No, this is not a time when you should be worried about entertaining. The guests invited to the morning after brunch should be your closest friends and family who are comfortable sitting around doing nothing. Although you don’t need to have planned activities, it is always fun to open gifts as a group, look at photos and videos from the night before and share stories. The bride and groom should plan on just being around most of the day so the family and friends that traveled from further out can spend some extra time with you before heading back. Did you decide to have a brunch the morning after? What are your suggestions for making it a success?